Trying to replicate that delicious meal you shared at your favorite Chinese restaurant, details mean everything! You stir fried shrimp, chicken or beef and vegetables to perfection in a wok pot. Your sticky rice done just right in the bamboo steamer. You even made your own Fortune Cookies! Oriental music playing softly in the background, to create the mood. The table set complete with candles, rice wine and bamboo place mats. Impressive! Then, you unwrapped disposable chopsticks for each place setting? Why? 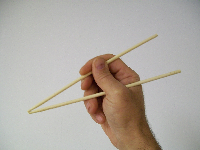 Common disposable Chopsticks, usually made of Bamboo or Aspen wood, can be very difficult to use and painful to hold properly. The making of these disposable chopsticks, a wasteful practice which only utilizes the fine grained wood leaving the remainder to rot or burned to make room for the next planting. Whether you mean to impress your dinner guests or live green, with little wood working experience, you can make your very own reusable chopsticks. When every little detail counts, it pays to make an effort! 1. Take an 18" by 3/8" hardwood dowel rod, mark the middle, and score it deeply with the sharp blade of a pocket knife. Snap it in half so that you have two nine inch sections. This makes one set. 2. Use the blade of the pocket knife to carefully and uniformly taper approximately one third of each chopstick to a point. Make the point no sharper than a dull pencil. Remember that this is an eating utensil not a skewer. You want to pick up a single grain of rice without having to stab it. 3. Use all three grades of sandpaper, course to fine grit, and smooth each chopstick to a fine finish. Wipe them free of saw dust before applying the first coat of Tung Oil. Lightly sand each one, with 400 grit sandpaper, before applying a second coat of Tung Oil. You can apply a third coat, for good measure. Re-coat your chopsticks periodically, depending on use, to keep them waterproof. * Learn proper tradition and use of chopsticks, for a more enjoyable eating experience. * Be sure to wipe clean and pocket your reusable chopsticks, if dining out, rather than absentmindedly leaving them at the table. Wash them in warm soapy water, when you get home. * You can make quick chopstick rests out of 3-4 inch lengths of the same dowel stock. Just sand one side flat and carve a notch or two on the rounded top to keep them from rolling. Finish them as your did your chopsticks. * Tung Oil is non-toxic and does not promote the growth of bacteria or fungi. * Use the fine tip of a wood burning tool to create messages & sayings of preference.